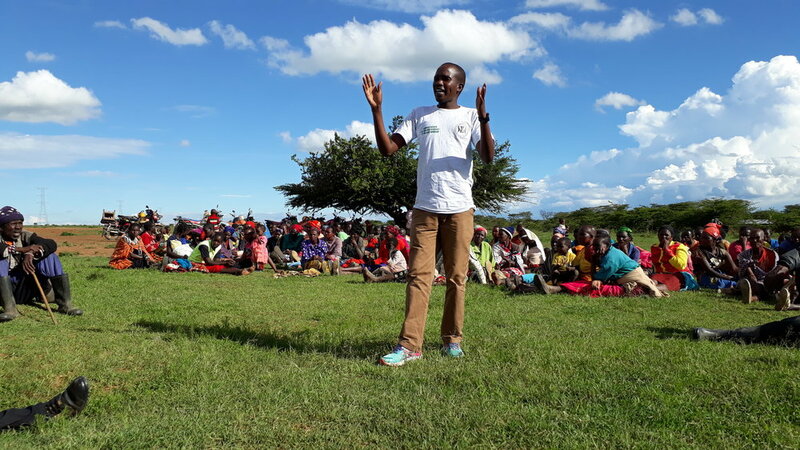 In June 2018, IMPACT Finance and Administration Officer Elizabeth Silakan, Program Officer John Tingoi and Samburu Women Trust Director Jane Meriwas shared their thoughts on collaboration and movement building for land management and land rights. Click here for more information about this CJRF-funded grant. CJRF: What is your organization’s mission? Elizabeth Silakan: IMPACT envisions an inclusive society where the rights of indigenous peoples are recognized and respected. Jane Meriwas: Samburu Women Trust is a women-led organization that amplifies the voices of women, mostly pastoralist and hunter-gatherers, to influence policy that targets women. John Tingoi: This funding enables organizations to work in a coalition and to help pastoralist communities in Northern Kenya to build resilience towards climate change and empower them to work for themselves. Elizabeth Silakan: The grant will build the capacity of the CSOs [civil society organizations] that are working in Northern Kenya to influence policies on climate change. Jane Meriwas: The grant will amplify women’s voices around climate change resilience, issues on participation, and issues on the Community Land Act. Jane Meriwas: It brings together different organizations working with indigenous communities in Northern Kenya, a place which has mostly been forgotten. We can bring our expertise and knowledge, and also traditional mechanisms, [to address] issues of climate change. Elizabeth Silakan: This project is unique in the way that it will bring expertise of all the small groups that have been working in Northern Kenya. We will have a better outcome because the expertise and strategies of different individual CSOs will be put together. Jane Meriwas: Success has two dimensions. Success means that you are able to implement effectively and get all the outcomes. Success can also mean failure: that you are not able to effectively implement the project in the way you initially indicated, but that this can also be a learning platform where we can share knowledge about what’s really worked and what’s not worked. John Tingoi: I think success here means: what can the community take forward after implementation and after the funding? What are the learning points as a result of implementing this project? John Tingoi: The approach we are using is community-driven and the target is the community. Within IMPACT we have asked: why are we doing advocacy? Because it is in the interest of the community. What is important is that the project strengthens the community capacity and raises their voices. Jane Meriwas: When you talk about climate change and resilience, indigenous people have been the custodians of that knowledge and they have solutions toward climate change. Yet, the money has mostly been given to other organizations that then subgrant to indigenous people. I am excited [that] for the first-time, money for climate change is being given to indigenous people to manage themselves. Also, I am more excited that we are bringing expertise on issues of women and the voices of women in developing policy and in the implementation of this grant. Elizabeth Silakan: Climate justice means measures are put in place so that the challenges of climate change can be mitigated. John Tingoi: I think climate justice means being fair to the environment and acknowledging and accepting restrictions around you so that you can divine your own mitigation mechanisms for coping. Jane Meriwas: What I love about the location is that it’s not something new. It is somewhere that I have been working. The environment is not new. It is something that we will be able to maneuver around to develop key strategies. The environment is friendly. John Tingoi: We are used to this environment. We have been working for many years within these communities. The most interesting thing is that initially it was a community that was left out in terms of development and in terms of government policies. Now we can see a change.